after some missed crossroad and some missed cobblestone section. It was sunny in Roubaix, and was warm. I parked close to the velodrome and I tried to went in it. There was the hell of poeple over there. I had the opportunity to watch the magic track for a moment; its surface was shining bright. There was a mystic silence inside that place. All the people was watching the mega screen where the live race was broadcasted by the French television. The Mapei team was clearly dominating the competition and Ballerini was leading with an unbelievable margin on the chasers. I decided to find some more comfortable place out of the velodrome, some good position to spot the race. There was a perfect place at the entrance of the velodrome, but a Genrdarme didn't allow me to stop there. So I moved the way back on the main boulevard coming from Hem to Lille: the race was just opening to the "Espace Crupelandt", last symbolic cobblestone section inaugurated the year before, so I decided to stop there. At the end, it was always an official cobbled sector. Waiting the race, I felt a bit of sadness looking around and watching the people of Roubaix, realizing that the town that I was dreaming for years it's just a grey suburb, where people have other to think than a bike race. Tall red dark buildings and wide windows. The race came. The sun was low on the horizon and the cars were passing very fast, sometimes hitting the ground while jumping on the road back. Ballerini came fast and left very fast. 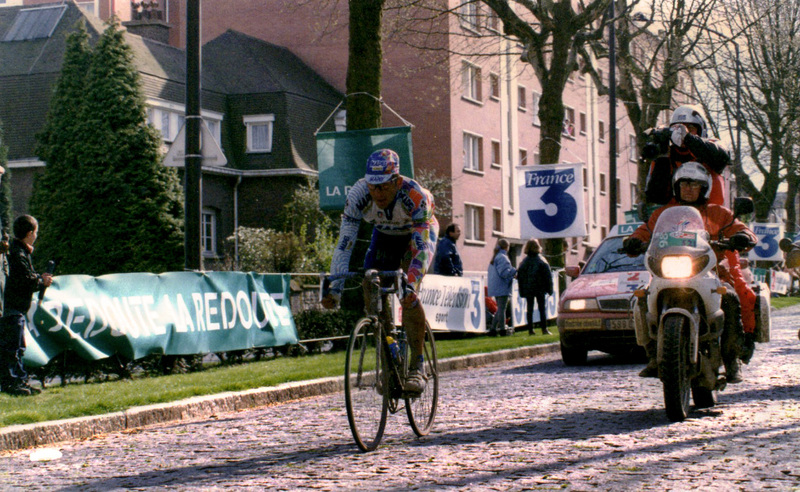 He was flying on the way of his second Roubaix, the majestic one. The other started to come after more than 4 minutes. Mapei Team made again 1-2-3 on the podium and my idol Musseuw never arrived because of a terrible crash in the forest. That day just 49 rider completed the Paris Roubaix in time, 16 more came to the velodrome out of the regular time and all the other 120 were all exhausted, injured or lost somewhere in the North. After a day when clouds, and sunshine and rain mixed each other more than once the sun in Roubaix was at the horizon but was steady. And I like to remember about it.